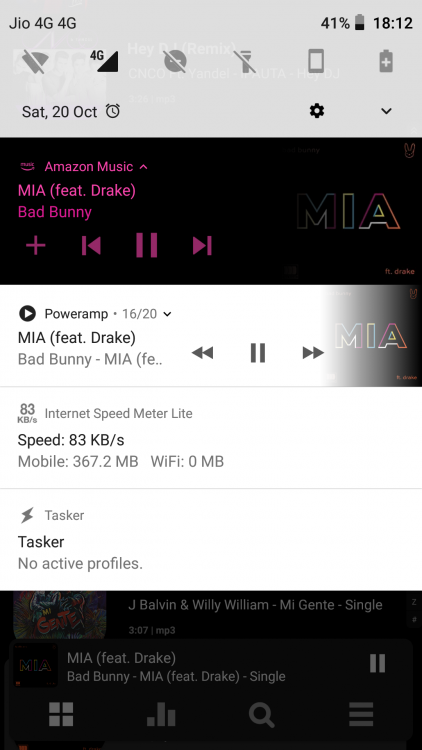 There's a new bug, I cannot open the output options, Poweramp crashes when I try to open it. I use Samsung Galaxy Tab S3 with High Res output and a Huawei P9 Lite 2017, the same thing happens with both. Sorry for my bad english by the way. Rainbow skin, with the default skin there's no problem, but alternative layout looks like this. Then the bug is not for Max to fix, it's for the Rainbow guys to fix, ask them to issue an update. 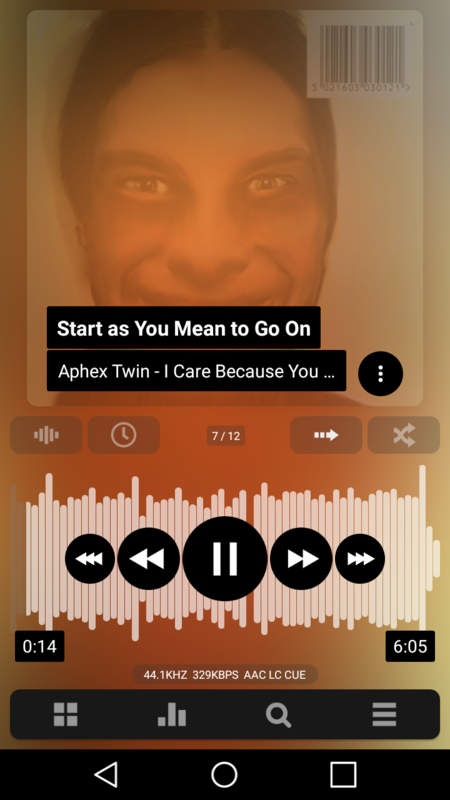 A bug remains where the album art randomly doesn't show on some tracks (within an album), and requires going back to the list, then to the player to refresh/show it correctly. Why on this build coloured notification is not showing up? Gracias @ maxmp por su trabajo y dedicación. En Este bulid las notificaciones perdieron el color ? 1. Bulid 799 (Notificación a todo color diseño material). Fixed in 801 (for Xiaomi A* series / non-stock Xiaomis). Thank you for the update, but i get force close entering in audio output settings, comes back to settings menu itself. Already sent bug report, but i want to know if someone is experiencing this as well. Fixed in 801 - Spanish translation bug. Please do the Full Rescan (or may be clean reinstall). Due to various beta issues sequential database upgrades can cause desyncs. Tracks still not auto-advancing unless I enable crossfading. Interesting that my devices played 14 hours non stop - no issues now in build-800. Can I suggest clean install or at least, all audio options reset to defaults? Also, what is the active output when this happens - AudioTrack/OpenSL/Hi-Res? Is this wired or BT headphones? Btw I sample skin was updated for exactly this issue couple of weeks ago. ﻿It was broken in 799 due to folders hierarchy sorting issue. To make hierarchy shuffle work again please do a Full Rescan (so sorting is updated in the DB). I don't think I ever encountered that. Your device / Android OS? Does this happen for main screen or lists? Does this happen for some specific tracks or for the random ones? Do you mean the mini player below? After you boot your device, open Poweramp. Tap on the left side of the "mini player", with the art and text, NOT the PLAY icon. This should take you to the player screen with the expected song. The correct song should play from here, but the "mini player" will continue to show the incorrect song until you finish the list, or manually change list/album using the <<< / >>> buttons. A. Yeah, that's what I wanted to say. B. Already tried that, and the mini player (ok, I've got a question: What's the actual name of that?) won't take me to the playing screen in that moment... eventually, after a lot of taps, Now Playing screen appears, but playing the “wrong" song. This is not a normal behavior, except the case just after Poweramp started and file scanning is still in progress. During scanning, database is rapidly changing, thus, file lists loaded into player itself and UI may differ, but this desync should be immediately resolved after first initial long scan is done. It's generally not noticeable at all, unless your scan times are very long for some reason. Unfortunately, I can't reproduce this issue, I suggest clean PA reinstall (or data cleanup). I've seen it happen in the main screen and lists. Sometimes it will show opaque. It will display correctly as soon as I hit the pause button. I will test if my other devices have the same problem. Also I only noticed this in builds 799 and 800. I have 24 Bit Audio On , and whenever i plug in my earphones the music turns on , even when i have that option turned off in Headset Settings. i'm doing it every new release ?last time it somehow worked was in 792 build. every next build it didn't work at all. how can i help you to track this bug? Let me ask there else one more. Please, add color highlight for current folder too (as for current track). Headset controls are totally broken in this build. I can't reproduce this, also no headset code has been changed for this build. Check system level options (Sound / Earphone mode). Thank you, Max, waiting for 801 for Spanish translation fix, good job. Apologies , OOS earphone mode was the culprit. on 800 the player just cut over to the first song in the list a few seconds after the player started playing again on bluetooth. Updating now but not holding my breath for a fix. ¿Usas alguna Custom ROM, o un Theme Engine (como Substratum)?